A big size piece in an unusual style for Lladro, depicting Anubis, the god from Ancient Egypt. It is a replica of the one in the Egyptian Museum founded in King Tutankhamen Tomb guarding his mummy. Anubis is the Greek name for a jackal-headed god associated with mummification and the afterlife in Egyptian mythology. 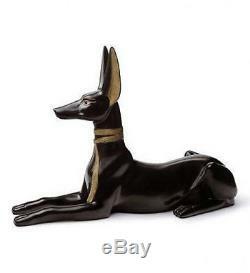 The Anubis black colour was not a sorrowful and fearful colour in Ancient Egypt, but rather a fertility and prosperity colour, since the black soil left by the river helped good crops. This Lladro figurine is brand new and in perfect condition. It is made in Spain and comes in the original Lladro Box. The item is of perfect quality, (we do not sell seconds). We are an authorised Lladro stockist and are one of the largest distributors in the United Kingdom. All prices are quoted in Pounds sterling. Please note that Lladro items are dispatched within 10-14 days of placing your order. If there is a delay, we will contact you as soon as possible. We reserve the right to make corrections on any item. We will not process any orders where an error has occurred. The item "LLADRO Porcelain ANUBIS (01008439)" is in sale since Sunday, November 26, 2017. This item is in the category "Pottery, Porcelain & Glass\Porcelain/China\Lladro/ Nao\Figures".